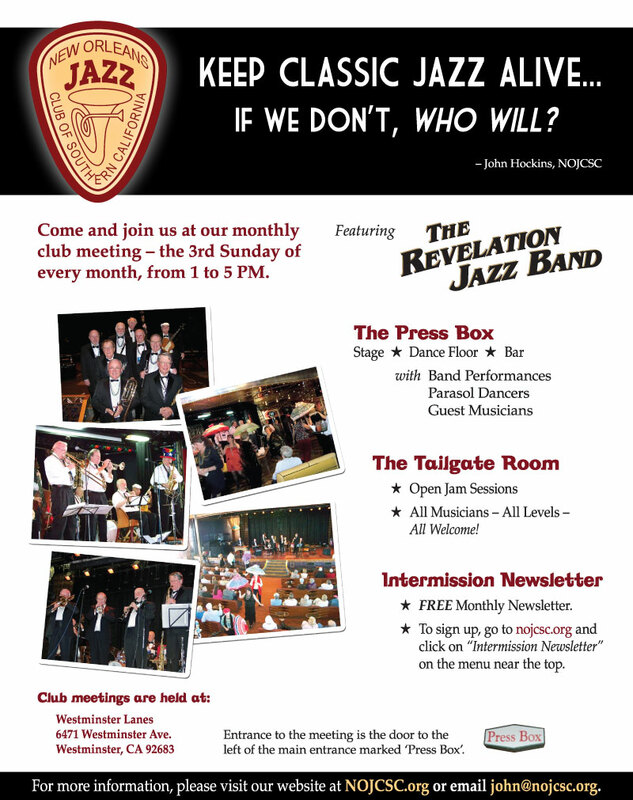 Please join us at our next Club meeting on Sunday, January 19, 2014 at the Press Box at Westminster Lanes, Westminster for an entertaining afternoon of Traditional Jazz and Swing featuring the Revelation Jazz Band, Youth Band and Club Musicians performing all afternoon! After eleven years in office, NOJCSC President John Hockins has resigned and retired. Mr. Ray Siegele, currently VP, will take over the role of President from January 1st, 2014. John will join the NOJCSC Advisory Board and continue to be available for consultation as required. The board extends it thanks and gratitude to John for his wisdom and his leadership in guiding the Club’s progress through the past eleven years. 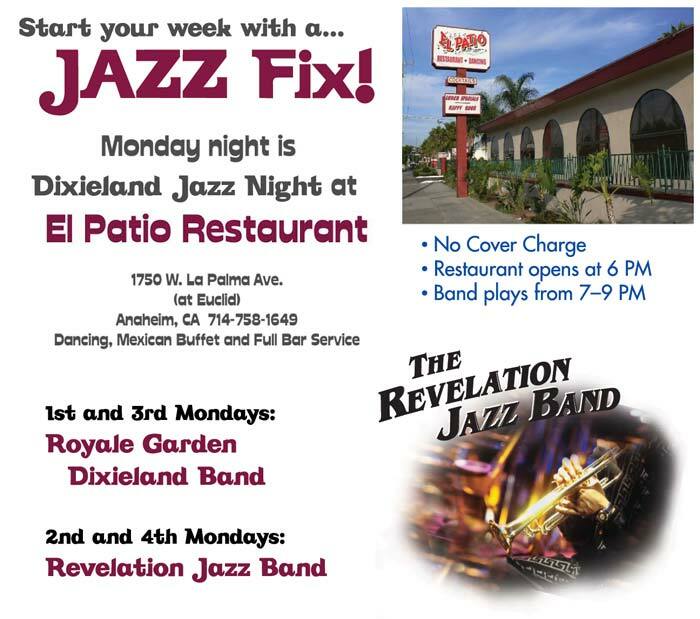 For the past several years, and at no cost to the club, we have enjoyed the Revelation Jazz Band providing music at our monthly meetings — despite the time, effort and expense the band members face in attending our Westminster Lanes meeting location. The band has proposed, and the club Board of Directors agree, it is time for this arrangement to be reconsidered. Beginning Jan 2014 the club will pay the band $210 per monthly session for their music service. The band will guarantee attendance for at least 6 sessions during 2014 and remain available to be approached for additional club engagements. Ray Siegele, our club Music Director, will continue managing our overall music program for both the Press Box (Main Stage) and Tailgate room. For their service to the club — both past and continuing — we owe the band, under John Hockins’ leadership, our most sincere appreciation. “Membership Drive” is continually on the agenda of your Board of Directors. How else is our club and the music we all enjoy to be kept alive? Keep the impetus of our club and the beat of the music energized! Spread the gospel and bring your friends and families to visit our Club at Westminster. Consider this: Together with our donation to such as the Youth Band Project, music scholarships, visiting bands and venue room rental, every other dollar of your dues payment is returned directly to you through our lunch buffets (4 times per year) and through our meeting attendance prizes and snack bowls. With the exception of 20 Honorary Life Members who have performed exceptional service to our club, there are no free passes. RENEW YOUR MEMBERSHIP NOW! For the good of the club, it is never too late! To join or to renew your membership, click here. As John Hockins, our past president says, “Keep Classic Jazz alive. If we don’t, who will?”. Our December meeting of the Youth Band included student musicians Afton Siegel, trumpet & drums; Nolan Delmer, trombone; Jared Crawford, tuba; and Brian Tyler, drums. A special thanks goes out to music educator and trumpeter Ryan Merrill, for all of his help in recruiting young musicians for the group! The Youth Band musicians performed “Tin Roof Blues” and “Down By the Riverside” during the first set on the Press Box main stage. Their performance was very well received by all! At each monthly club meeting, college and high school-age musicians will have their own rehearsal/workshop sessions starting at 11:30 AM in the Tailgate Room. 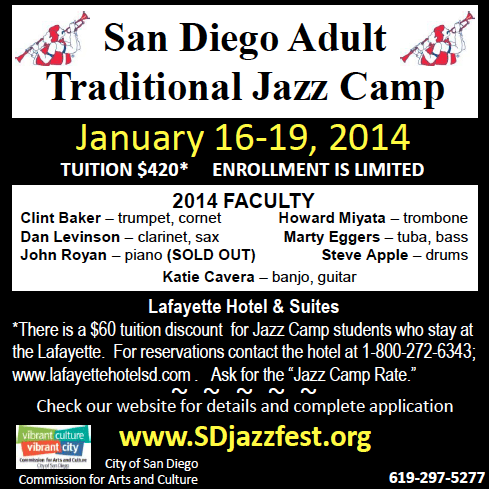 These sessions will be coached by trombonist and educator Steve Tyler. The group will rehearse and prepare two tunes to perform on the Press Box main stage during the 1:00 PM set. This month, we will be adding “St. James Infirmary” to the band’s repertoire. Be sure to “like” our Facebook page for videos, recordings and updates! The ultimate goal of the NOJCSC’s Youth Jazz Band project will be to form a true, self-contained performing ensemble, able to play at jazz clubs, community events and jazz festivals, without an adult musician needed to direct them during performances. If you know a young musician (perhaps a child, grandchild, or even a neighbor or friend) who might want to get involved, please let them know about us! We are especially looking for clarinet/sax, piano and guitar/banjo players. Please contact: Steve Tyler, steve [at] nojcsc [dot] org, cell/text (650) 224-8094. Stay informed of the Youth Jazz Band’s activities through the Intermission newsletter, our website, and by “liking” the NOJCSC Facebook page! Join us every third Sunday of every month for Great Music for dancing and listening, and a Great Place to celebrate LIFE! The following musicians joined us in December for jam sessions on the main stage: Gene Marklevits, trumpet; Dan Merrill, clarinet/sax; Phil Andreen, trombone; Jimmy Green, banjo; Bill Keys, violin; Bill Mitchell, piano; and Paul Goldman, drums. Each month, the Club also offers members a “Tailgate Room” set aside for musicians of all ages and skill levels to practice their instruments with direction from accomplished musicians. Tailgate room participants in December included: Alan Shelton, Ryan Merrill and Parker Snow, trumpet/cornet; Dave Conrad, Dan Merrill and Tony Hilly, clarinet/sax; Phil Andreen, trombone; Roberto Pasquariello and Darlna Phan, piano; Travis English, banjo/guitar; and Brian Tyler, drums. Tailgate Room — musicians, bring your instruments for a jam session. Sign in with the music director. This room is for you! As you know our website at nojcsc.org has been completely revised and revitalized. Please let us know what you think and any additions that you would like to see! The Club also has a Facebook page. “Like” our page to receive updates on Facebook. We will from time to time use photographs and/or video taken during the course of our Club Meetings. These photographs and/or videos may be used on our new Facebook page and website. Any member or guest must inform a board member if they do not wish to have their photo taken or appear in either photographs or video that may be posted online. —Board of NOJCSC. To apply, please fill out and submit the short online membership application on our website. If you have any questions, please contact NOJCSC president pro tem John Hockins at john [at] nojcsc [dot] org. It has been brought to our attention that visiting musicians are being charged at the door if they are not members of any club. This is counter-productive as it keeps good musicians from attending. Lots of good musicians live long distances from Westminster and asking them to pay to entertain us is not right. They are our hope of increasing attendance and we only exist to listen to their fine music. Let’s encourage them to come to entertain us and not discourage them before they’ve left home.